Popcorn. It’s the perfect snack for watching the World Series. (Unless you’re the girl sitting behind the owner/CEO of the Detroit Tigers, then it’s edamame–no joke, saw it with my own two eyes!). Come January my husband and I will be munching on Cub Scouts popcorn courtesy of my nephew. 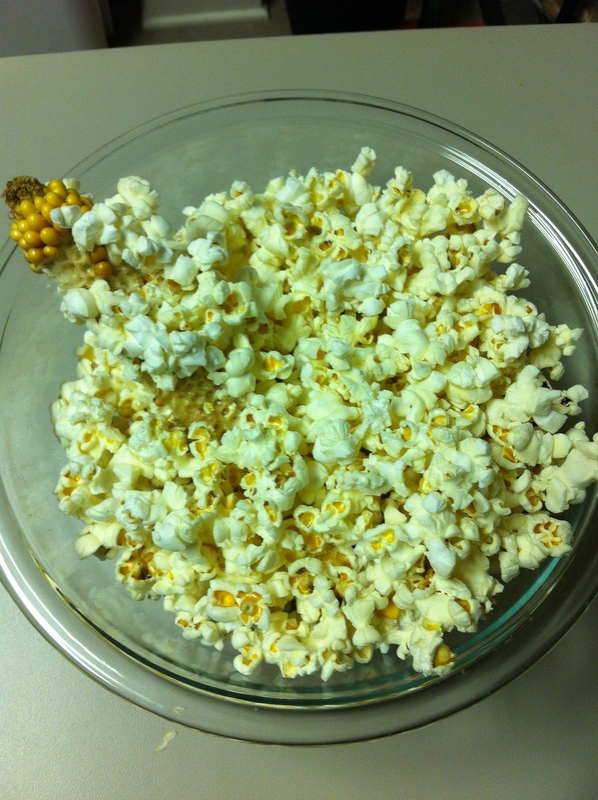 But before we move on to microwave popcorn with a purpose, we started with the most natural popcorn you have ever met. Check out this photo of a recent CSA share. We have seen what has become of the butternut squash (victims of the Giant Squash Roast). The kohlrabi, red onions, and green peppers are long gone, and we still have a sweet potato or two hanging around. But what are those orange things next to the peppers? I never would have known if it wasn’t for a friend of ours back in Ohio who had a CSA and once showed us an ear of popcorn! For a couple weekends she brought her ear of popcorn in a brown paper bag with some butter in it to every social gathering, looking for the right opportunity to pop it up and share it around. Unfortunately, we missed the big show, but I was glad to remember what it looked like so I didn’t just think it was a cute decorative earn of corn! 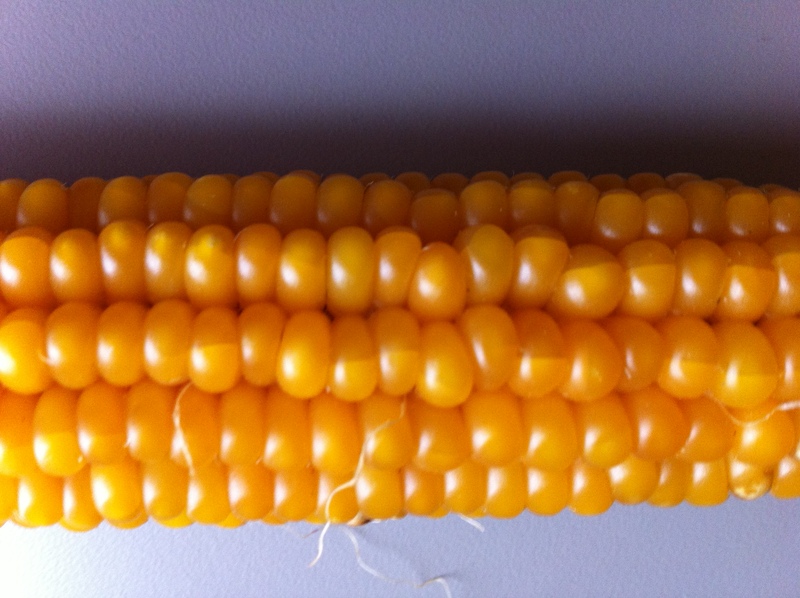 It’s the same size as a regular ear of sweet corn, but the kernels are hard and smooth, just like when you buy a bag of popping corn, or like the unpopped kernels at the bottom of the microwaved bag. They are pretty cool looking. And they really do pop just like regular microwave popcorn. We put one ear in a paper bag with a little pat of butter and microwaved it for just about 3 minutes. And out came…. Popcorn! It was so cool! And it made more popcorn than we could fit in the bowl! We refilled after chowing down the first bowlful. The natural popcorn obviously didn’t come with any flavorings, which was a totally new experience for me. I don’t think I had ever had “naked” popcorn before. No fake low-calorie butter, no excessive salt, no kettle corn sweet and salty flavor, nothing! So evidently this is what popcorn really tastes like! Not much, really. It’s quite bland. But I’m sure one could get used to it if one wanted to. Instead I melted some butter, poured it on the second bowlful, and sprinkled with some salt. And then it was really amazing! Maybe Orville Reddenbacher has figured out how to take all the fat out of his “buttered” popcorn, but I’ll take the real deal any day. And this looks way cooler, too. 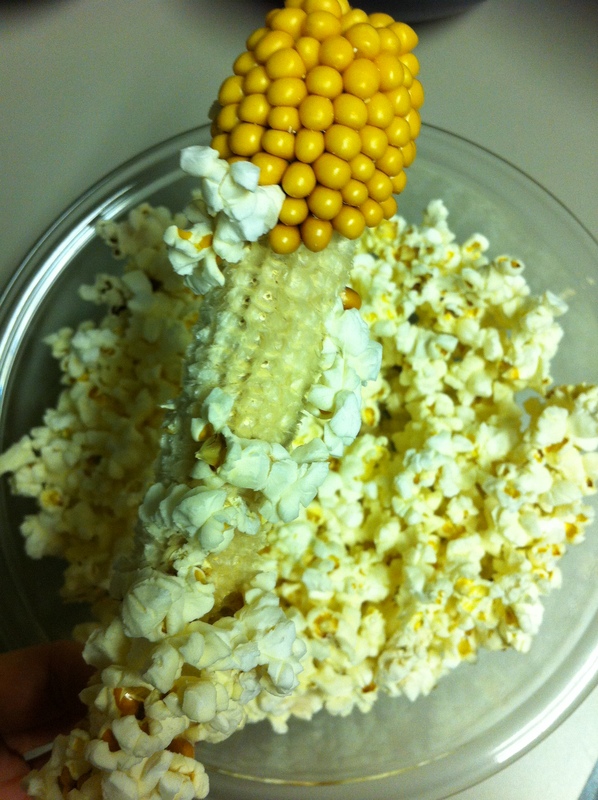 Have you ever seen or eaten popcorn off an ear? Next Post Next post: A Bye Night for the Cook! How cool that you put the whole ear in! I’d love to try this sometime. It was really fun! It was like a little science experiment. I’d love to pop one with my nieces and nephews and see their faces! Check farmers markets if any are still open in your area. That’s so neat!! I’ll have to try that with the kids!! Let us know what they think! I hope they are at least as entertained as the husband and I were. It brought out the kids in us! My parents have one of those! That’s how I first learned to make popcorn.